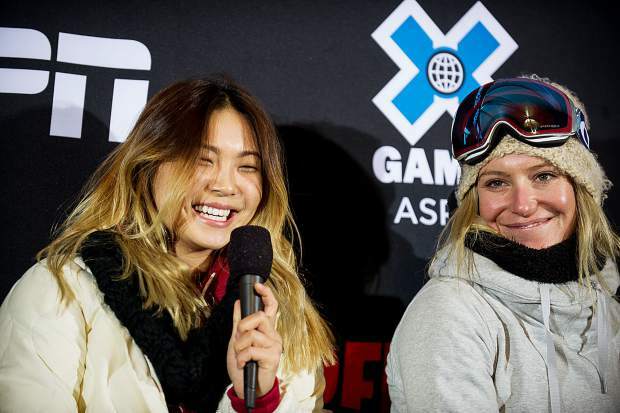 This is Chloe Kim’s world, and it has been for a few years now. The 17-year-old from California would likely have contended for an Olympic medal in Sochi, but she was too young to qualify for the 2014 Games. The two-time X Games Aspen gold medalist is a lock for the Olympics next month. She’s won both Copper and Dew Tour already this year, and should be the unquestioned favorite entering the Snowmass Grand Prix. The timeless Kelly Clark from Vermont is currently second behind Kim in qualifying, and is all but assured an Olympic spot, as well. Clark, 34, is a five-time X Games Aspen gold medalist and won Olympic gold all the way back in 2002 (Kim wasn’t yet 2). California’s Maddie Mastro, a relative newcomer, and Steamboat’s Arielle Gold sit third and fourth, while veteran stars Elena Hight and Hannah Teter are fifth and sixth. While Kim’s dominance has taken some of the drama out of the women’s halfpipe, the battle for those final couple Olympic spots could be intense. Expected to compete as well in Snowmass is Australia’s Torah Bright, the 2010 Olympic gold medalist and 2014 Olympic silver medalist. Bright has hardly competed the past two years, but seems determined to get back to the Olympics next month. The Olympic hopefuls in the men’s snowboard halfpipe are certainly familiar names. Oregon’s Ben Ferguson is currently the front-runner in terms of points. He’s having a strong season with a second-place finish at Copper where he was the top American and a third-place finish at Dew Tour. Should he finish as the top American in Snowmass, he can book his ticket to South Korea. Joining him could be Eagle’s Jake Pates, who trained with the Aspen Valley Ski and Snowboard Club back in the day. Pates, 19, is having a breakthrough season, highlighted by his win at Dew Tour. He was 11th at Copper. If he’s feeling any pressure it’s because he has superstars Danny Davis and Shaun White, as well as Ben’s little brother, Gabe Ferguson, breathing down his neck. White, who needs little introduction, is a two-time Olympic gold medalist in the halfpipe, although his fourth-place finish in Sochi probably still stings four years later. White was third at the Copper Grand Prix but failed to make the finals at Dew Tour. Davis, one of the most likeable guys in the industry, has a pair of X Games Aspen gold medals and was on the 2014 Olympic team for the U.S., finishing 10th. In the mix in Snowmass are Japan’s Ayumu Hirano, the 2014 Olympic silver medalist, and Australia’s Scotty James, the reigning X Games Aspen gold medalist.